Teresa’s Journey: I’m all in. Are you? Whether it is your first time attending the Triangle Race for the Cure or 23rd, Susan G. Komen’s signature event has something for everyone! In addition to the 5K run/walk, there is much to see – from hundreds of breast cancer survivors parading through the site to a tree covered in bras. Here are 10 things not to miss on May 4th! The highlight of the day, hundreds of breast cancer survivors and thrivers who are individuals living with metastatic breast cancer parade through the site, celebrating the number of years since their diagnosis. Also honored are those who provided care during their treatment. The celebration begins at 8:45am near the stage – don’t forget your tissues! Following the procession, survivors, caregivers, and individuals living with metastatic breast cancer are honored onstage for the annual Komen NCTC awards. Nominate someone today! Did you know that 75% of funds raised by Komen are distributed to local organizations delivering breast services including mammograms, diagnostics screenings, and education? Meet the local recipients of Komen NCTC’s Community Health Grants and learn how they’re serving breast cancer patients right here in North Carolina with the funds they’ve received. 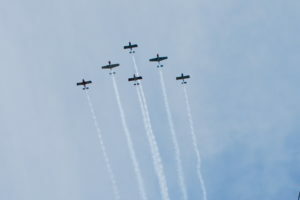 Bandit Flight Team delivers an unforgettable flyover at the start line of the untimed 5K. Celebrating survivors and honoring those who have lost their fight, the flyover is the perfect way to start the main event at 9:30am. Curious how the remaining 25% of funds-raised are used? Susan G. Komen funds breast cancer research projects across the country. There are several funded researchers in The Triangle. Be sure to visit this tent near the stage and learn what they’re working on! Read more about local research today. The Race for the Cure is for the whole family! 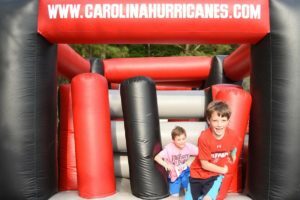 Visit the Family Fun Zone with your kiddos, where they’ll get their faces painted, practice their slap-shot skills with the Carolina Hurricanes, say hi to Stormy, and take a run through the inflatable obstacle course. Be sure to stick around for the Kids Dash at 11:00! Breast cancer impacts many in our community, including businesses in the area. Visit the companies who have pledged their support to learn about what they do and why the fight against breast cancer is important to them. 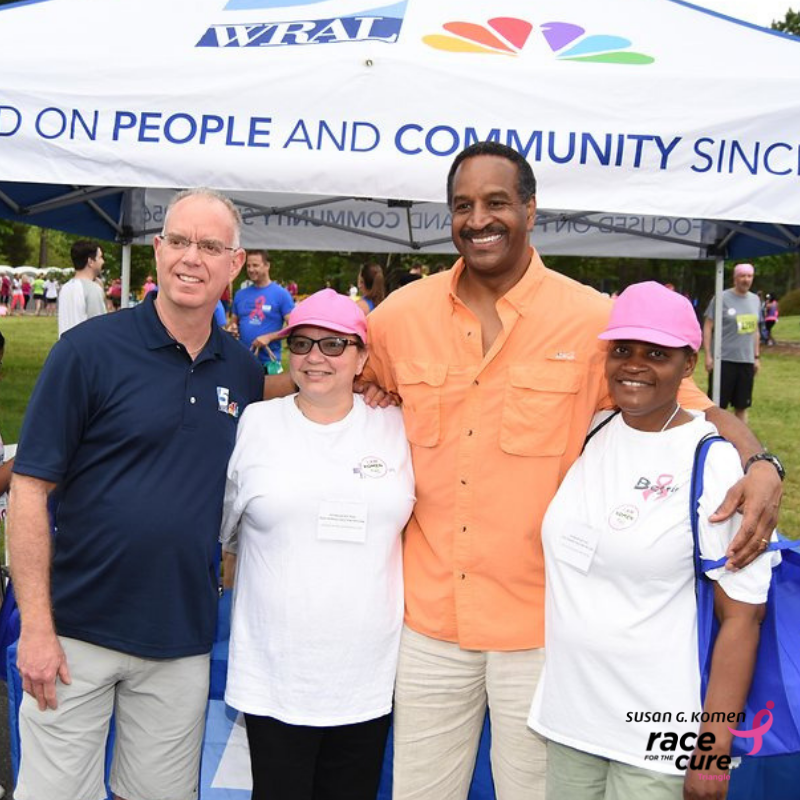 Thanks to all of our sponsors including local presenting sponsor Duke Cancer Institute, spotlight media sponsor WRAL, and host sponsor The Research Triangle Park. Click here for full list of 2019 #KomenTri sponsors. If you thought the team names were creative, just wait until you see the outfits on Race Day! From tutus and graduation gowns to homemade t-shirts and a bubblegum-pink sport coat wore by our emcee, the sky is the limit on the crazy couture. Look for our t-shirt tent so you can vote for your favorite team t-shirt on race day. Sandwiches and tacos and popsicles, oh my! Don’t forget to visit the food trucks in the tailgate zone before and after the 5K run/walk. Feel good about your purchase, because a percentage of sales will be donated back to Komen NCTC. Volunteers will be stationed along the 3.1 mile course providing encouragement, spirit, and fun! Groups include senior cheerleaders, musical acts, youth teams, and more. Be sure to wave hello on your way past! Thanks to the generosity of A Sole Team for Vickie, every toss of the bean bag results in a $1 donation to Komen NCTC, with bags that make it in the corn hole earning $3! 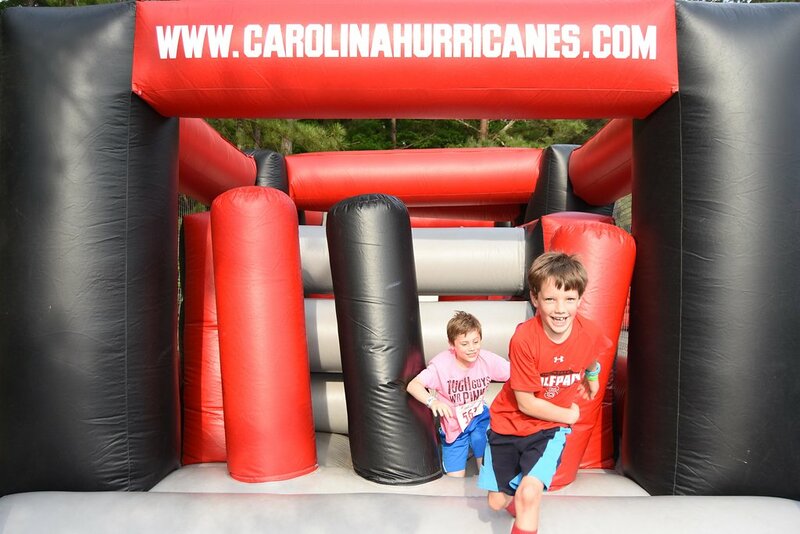 There is no charge to play, so don’t leave the site until you visit the corn hole boards set up near the stage. 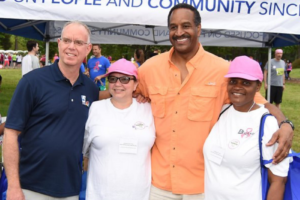 We look forward to seeing you at the 23rd annual Triangle Race for the Cure on Saturday, May 4th!